Hubert Camenzind, (Gersau, Swiss): Camenzind was a clarinetist and saxophonist. After he had started his ten-year activity in a silk spinning mill in Gersau at school age and had been introduced to clarinet playing by a member of the local music society at the age of seventeen, he moved to Seewen in 1945, where he stayed for a short time. Then he joined the professional band of the accordionist Ernst Zwahlen from Interlaken, with whom he worked monthly for over five years in concert venues such as the Genferstube and Glocke in Bern. His services as an experienced wind player, whose role model was Jost Ribary, he lent in the further course of his career as a musician to many renowned bands from the Bernbiet, such as Fritz Mosimann, Walter Balmer senior, Lorenz Giovanelli and Viktor Gaggioli. Residing in Bönigen from 1951, he retired from professional music at the age of forty at the end of the fifties. He then found employment as a storekeeper at Mühlen AG in Interlaken, but nevertheless continued to make music part-time until 1970. A physical condition forced him to stop his career early. All the more zealously he occupied himself with composing, in which he eventually produced about 150 pieces. His best-known titles, published by Gottfried Aegler, are ‘Schwyzergeist’ and ‘Fest im Schritt’, the latter a march for wind music recorded by the papal Swiss Guard on record. 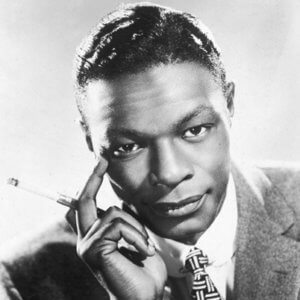 ‘Nat King’ Cole, (Montgobery, Alabama, USA): The American jazz musician, singer, pianist and actor died of lung cancer at the age of 46 on 15 February 1965 after a brief illness. Already in 1934, at the age of 15, he had his own band. In 1939 he founded the King Cole Trio, in which already an electric guitar was used, which was unusual at that time. The trio quickly became popular in America as an instrumental group. When Cole started singing, his actual success began. Ready 1944 the first record was found in the American charts. Many of his songs became evergreens. Walter Alan Finlayson, (Burlingzon, Vermont, USA): Walter A. Finlayson earned a Bachelor of Science in Music Education from Ithaca College (1941) and a Master of Arts degree in Music from Columbia University (1957). He studied composition with Norman Lockwood. Although Finlayson is known as a composer/arranger, he is also a professional artist who illustrated the covers of children’s piano pieces for Boosey and Hawkes. His career as a music educator includes the chairmanship of the Katonah-Lewisboro School music department. He retired in 1974. Luther Lincoln Henderson Jr. (Kansas City, Missouri, USA): Henderson was a master at arranging in any style, and has been a principal arranger on Broadway for decades. He had a particularly strong relationship with Dixieland music and early American jazz and blues. He grew up with this music, and knew firsthand some of the musicians who defined and developed these styles. He also became famous as a composer. Kurt Schmidek, (Wien, at): Kurt Schmidek taught singing and oratorio at the University of Music in Vienna and was also a music critic. Marcel Wahlich, (Zürich, Schweiz): Marcel Wahlich was born in Zurich’s old town as the son of a well-known wind instrument repairer. There he grew up in the care of a music-loving family (his father was president of the Stadtmusik from 1924 to 1946). He received his first music lessons from Gian Battista Mantegazzi in the boys’ music of the city of Zurich. After finishing school, Marcel Wahlich began dedicated music studies with Emil Fanghänel at the Zurich Conservatory – now the Musikhochschule – majoring in clarinet. After graduating, he expanded his knowledge under Paul Müller with counterpoint studies and under Volkmar Andreae he was trained as a conductor, with the then director of Stadtmusik, Gian Battista Mantegazzi, contributing his specific skills for the brass section. After his state examination, his career as an accomplished clarinettist led him for thirty years to various symphony orchestras and the Swiss Festival Orchestra Lucerne. He also taught at various music schools and grammar schools, and in 1963 he was appointed clarinet teacher at the vocational school of the Zurich Conservatory. From 1958 onwards he conducted various wind orchestras in the upper performance classes. For many years he also presided over the music commission of the Swiss Workers’ Music Association. It is therefore hardly surprising that the existence of an efficient wind orchestra in Switzerland inspired Marcel Wahlich to study the composition of symphonic wind music. The diversity of his oeuvre is remarkable, ranging from ballet music and concert works to instructional literature and over almost 50 marches, each with its own unique sound, to expressive compositions for wind orchestras. His music is characterized by stylistic independence, melodic originality, harmony and rhythm. Marcel Wahlich has received many prizes and awards for his compositional work.